This is one of those "based on true events" films that the moment you return from the theater you're going to hop on the internet and explore the story. That's a good sigh. Unfortunately, here the need to do some fact checking might not stem from all the right reasons. 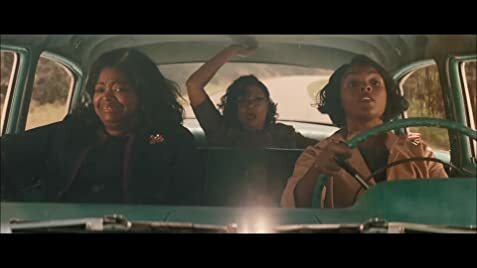 Hidden Figures is an upbeat, inspiring tale about the role three African-American women played in the NASA program during the early 60's. First Katherine Johnson (Henson), our lead, a gifted mathematician and human computer trying to carve out a roll in the Space Test Group. Second, Dorothy Vaughan (Spencer), leader of the "colored computers." She wants both the supervisor title she deserves and to survive the transition to IBM's mechanical computers. 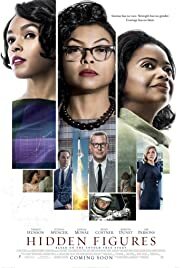 Finally Mary Jackson (Monae), who is trying to overcome discriminatory policies to become NASA's first female engineer. These women must meet challenges in the workplace then return home to more struggles African-Americans were fighting nationwide. Having the performances to anchor your character drama goes along way. Henson is solid, but Spencer is Oscar worthy and Monae's performance is part of a spectacular 2016. I will be on the lookout for more from this talent. Kudos to the supporting roles played by Ali and Costner. Beyond the highlight performances, the scenario is well worth a shot. We have seen heroes fighting against segregation. We have seen space race movies. The mix presents America at its finest and most appalling. A cute combo. The woman at the core are also very deserving of a chance in the sun. The problems creep in with presentation. The director/writer Melfi and co-writer Schroeder were clearly unsatisfied with the quiet, real nobility with which these woman conducted themselves. I cannot say if what the creators did is ethical, but the addition of obviously manufactured drama was a damning decision. This leads to some awkward trust issues. After watching some Hollywood like Johnson erupting at her boss's boss, it becomes more difficult to believe in the little things. Did Johnson really need to run a half a mile just to use the restroom? Or even the climax. On the day of the launch, did John Glenn trust Johnson's calculations over the IBM? It turns out only one of these inclusions are factual. Not the one you think, and perhaps the true story demonstrates more bravery. I'm not going to share any more of my digging here. Others asked the same questions and the answers are readily available. The point is after I watched Hidden Figures I wanted to learn if I had been lied too. Sad, because doubts are not what stories this wonderful deserve. Beyond this major stumble, Hidden Figures is well worth anyone's time. Educational, but entertaining. Positive without preachy. Family friendly in a genuine way. At the theater, I sat next to a nineish year old who kept asking her mother questions. The daughter was interested and wanted to follow every detail. The mother gave brisk answers not wanting to miss a moment. That's a true event, I swear, and the best praise for Hidden Figures I can muster. 125 of 193 people found this review helpful. Was this review helpful to you?